I get a lot of questions about this one. "What the heck is the Foreasting system?" "How is it different than other systems?" "Why is this the system you, Kevin, gravitate to?" Every individual, knowingly or unknowingly, runs an Analytics system. Your system, of course, represents the basis for how you approach obtaining answers to questions. 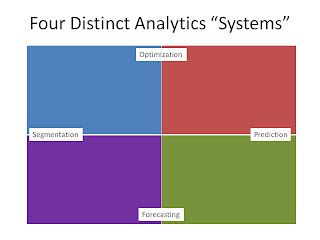 Segmentation, Optimization, and Prediction systems are predicated on finding answers to marketing questions. The Forecasting system is predicated on finding answers to customer questions. Here's the reason I like to run a Forecasting system. I'm working with a client last year. The client is frustrated ... a marketing campaign in August worked great, a marketing campaign in September worked terribly. The question from the client ... "how do we get both campaigns to work perfectly?" 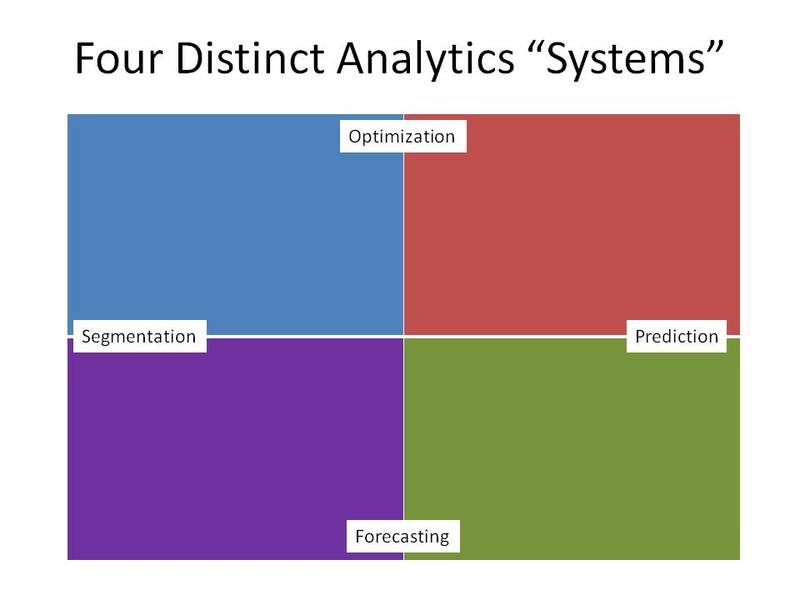 In a Segmentation system, and Optimization system, and a Prediction system, you go to work, analyzing the differences between each marketing campaign. You compare and contrast, you do a ton of work, you highlight the differences, and you work on making sure that next year, things work out better. In a Forecasting system, you ignore the campaigns. I know, that goes against every single thing you've been trained to do. Here's what I did. I froze the customer file as of 8/1. I then measured repurchase rates from 8/1 to 9/30. I analyzed reactivation rates among 13+ month customers. I analyzed new customer acquisition in this sixty day period. I compared these metrics across the past three years. Guess what? Repurchase rates were the same as last year. Reactivation rates were the same as last year. New customer acquisition counts were the same as last year. All three metrics were better than two years ago, and better than three years ago. In other words, the overall health of the business was fine. Marketing campaign performance was variable. This is a distinction that wastes a tremendous amount of time withing companies. 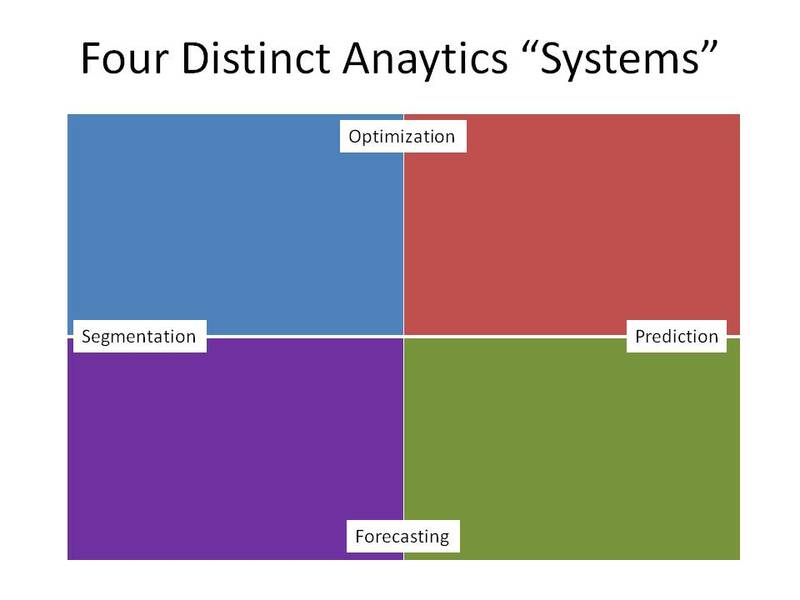 Under the Segmentation, Prediction, or Optimization systems, companies analyze campaigns that are inherently unstable, unpredictable, unreliable, and variable. Significant effort is made to improve campaigns that, on average, have a +/- 30% variability rate without or without improvement. In other words, you could have a campaign that performed 50% above plan last year, you improve the campaign by 10%, and the campaign performs at -15% to the prior year ... this isn't because the campaign performed bad, it is because of random variability. When you measure performance over time, independent of campaign performance, you often see a different story. You often observe consistent trends, a stable file, a file that is driven not by marketing campaigns, but by organic purchases and new customer increases. This is the magic of the Forecasting system. You focus efforts on pre/post periods, you ignore marketing campaigns, you extrapolate current trends into the future to see where your business is heading. Now, I can hear the complaints, from near and from far. "If you figure out how to make both marketing campaigns work, your business will be twice as good, so you're better off fixing the one that doesn't work!" I wish the world worked like this. When viewed through the eyes of the Segmentation, Optimization, or Prediction systems, this is possible. When viewed through the Forecast system, you realize that your customers are going to repurchase at 45% rates, purchase two times per year, and buy three items per order. These rates, on an annual basis, seldom vary by more than +/- 10%. You miss the reality of your business when you focus on marketing campaigns. That's why I have shifted, over time, from a Optimization/Prediction system, to a Forecasting system that skews a bit toward Segmentation. I can more quickly focus an Executive team on the real reasons why a business is succeeding or failing. Having your eye on long term performance makes infinitely more sense than trying to improve short term campaigns, where even any apparent "improvement" may just be the result of random variation.